Implementing a consistent routine allows you to manage your database effectively. Here are some suggested daily procedures to help you stay ‘on top of it’. As you receive cash or check payments at the front desk, make sure you enter them immediately into Jackrabbit. You can print a receipt for your customer if needed. If you accept cash at your facility, it is important to reconcile your cash drawer each day. Use the Deposit Slip report, filtered to only show cash, to ensure what is entered in Jackrabbit matches the cash on hand. Print your Deposit Slip report and use it for your bank deposit. The Deposit Slip report is organized by payment method, making it easy to reconcile all payments received at your facility. 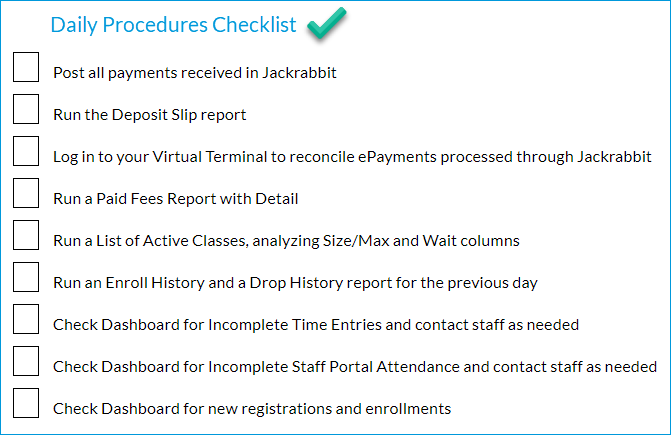 Jackrabbit initiates ePayments (Credit Card and Bank Draft payments) which flow through your Virtual Terminal. It is a good idea to make sure both sides match. Compare your ePayment transactions with your Virtual Terminal. There is a detailed description of this process in our Best Practice article ePayments & Bank Reconciliation. The Paid Fees Report, showing detail, can help you find unapplied payments that can be linked to unpaid fees. Checking this report daily will help you locate unapplied payments quickly so they can be linked easily. Your list of active classes allows you to see which classes have openings, future drops, and waitlists at a glance. Scan the Size/Max and Wait columns to see if there are classes that are full or have a large wait list. Is it time to add another class? The Weekly Calendar is another great way to see your classes at a glance. The Weekly Calendar button is available from your Dashboard and the Calendar button appears in the top right corner of each screen. Run an Enroll History report for the previous day to create a list of students who are newly enrolled. The results page allows you to email the students who are new to your program from the list. Run a Drop History report for the previous day to create a list of students who were dropped from classes. Make sure any related fees are removed from the family’s account, if needed. If you are using the Jackrabbit Time Clock, keep an eye on your Dashboard for any Incomplete Time Entries. Address these with your staff as soon as possible to ensure accurate records and eliminate issues prior to the payroll deadline. Check your Dashboard for Classes with Incomplete Staff Portal Attendance. You can add a message to the instructor’s portal directly from here, asking them to complete attendance. If your database is set up for texting, you can text them from this report as well! Double check the Key Metrics on your Dashboard for new Web Registrations and Parent Portal Enrollments to verify all related fees have been posted (registration fee, tuition, etc). Depending on your settings, fees may or may not post automatically. Registration fees for Parent Portal enrollments will need to be posted by a Jackrabbit user. Using Post Annual Fees allows you to post registration fees to all enrollments within a chosen date range at once! Day-to-day procedures are an essential to your running your business. Keep in mind, all organizations are different. Use these suggestions to devise the best daily to-do list that works for you and your staff. Check out our sample daily checklist below!